You wish customers had only good things to say about your company, product or brand. Instead, they seem only too ready to share their negative experiences online. Can organisations benefit from this negative attention? In the social media workshops I participate in, one theme pops over again and again: what if customers say bad things about me? Businesses big and small fear negative word of mouth (WoM). In the current technological environment, disgruntled customers can voice their dissatisfaction through very public platforms such as status updates, blog posts, videos, etc… These negative comments may reach viral status influencing a large number of customers. Those same comments will remain online, influencing potential customers long after the initial problem has been solved. 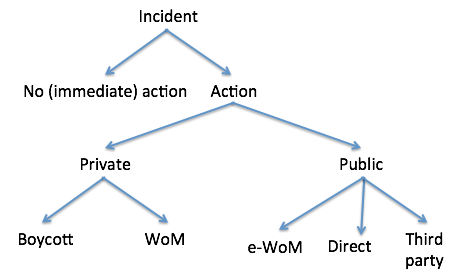 It is, thus, no surprise that many organisations are concerned about the consequences of electronic WoM (eWoM). However, that does not mean that organisations should fear eWoM and here is why. Problems happen. Sometimes it is your fault; sometimes it is beyond your control. Sometimes it is not even a fault, but rather a problem of inflated customer expectations. Whatever, the case, wouldn’t you rather know when your customers are unhappy? Research shows that only a minority of unhappy customers complain directly to firms, following a negative consumption experience. Most will simply switch to another service provider and share stories about their negative experiences with their social connections. Not hearing from unhappy customers may lead organisations to a false sense of security – comfortable, maybe; but not very helpful. eWoM gives you another channel to the customer. It allows you to participate in what were, previously, private conversations (figure 1). Once you hear that a customer is unhappy, you can intervene. If you can address the customer’s concern, you will improve customer satisfaction. Research shows that the majority of dissatisfied customers whose complaints are handled in a timely and effective manner go on to repurchase from the business. Retaining customers has very tangible benefits for the organisation: existing customers are more profitable because they ask fewer questions, have more realistic expectations, are more familiar with company employees and products and have lower price sensibility than new customers (source). It may be counter-intuitive, but read on. In a world where customers increasingly seek out other customers’ reviews and recommendations prior to purchase, negative comments may actually help you sell. An interesting piece of research explained here indicates that, as far as eWoM is concerned, quantity is more likely to influence purchase decision than quality (i.e., whether the review is positive or negative). This effect is particularly relevant in the early stages of the product life cycle. It is human to dislike criticism, but organisations can not afford to ignore it. Any thoughts on this topic? P.S. – I am conducting research electronic word of mouth. I am looking at users’ perceptions of how organisations deal with their negative feedback. Would you like to participate? Please contact me or leave a comment below.